Living with chronic heel pain in Aberdeen? Every now and again as a clinician you are amazed at the results you can achieve from non-invasive treatments and this following case is definitely in that category. Gordon, an active gentleman in his 50’s, attended our clinic back in July 2016 complaining of longstanding pain at the base of his right heel. Now semi retired, Gordon loved nothing more than a game of golf with his friends. In recent years the pain in his right heel had been increasing when walking and standing and despite taking pain relieving medication the intensity at times was too much and Gordon would retire to the clubhouse as his friends continued playing. It simply was not worth it. Noticing that it was affecting his mobility and ability to play the game that he loved he decided it was time to seek medical help. Following advice from a family member he decided to pay us a visit at the Shand Practice, a podiatry clinic based in Aberdeen with over 60 years of experience in the treatment of foot and lower limb problems. Gordon attended the clinic for a consultation with our lead podiatrist; Scott Shand and we began the session by obtaining a detailed account of the patient’s medical history, the nature of the condition and site of the pain. It was ascertained that this problem had been with him for over 20 years. In his line of work as a pharmacist he would stand many hours every day usually on solid surfaces and he just thought that it was par for the course (pun intended) to have sore feet when standing for long periods of time. He tried stretching, ice packs, pain relief medication and altered the type of shoe he wore daily, this strategy did little to ease his symptoms however. On examining the sole of his right foot, pain was elicited when pressing on the base of the heel and on the inside aspect of the heel. The range of motion of the foot was restricted and the arch flattened when standing. On analyzing his walking gait using our treadmill, we could see that there were significant mechanic flaws which could cause this type of heel pain. Gordon reported no history of direct trauma (no falls, knocks, broken bones or accidents) and his medical history was generally very good for a gentleman of his age. He did not complain of any other joint pains or illness and his weight was normal. Given the site of palpation pain and the pattern of pain it was deduced that Gordon was suffering from Chronic Plantar Heel Pain Syndrome. In Gordon’s case we believed that a calcaneal spur was present at the inner aspect of the heel bone, there was reduced fat padding of the heel and that there was likely thickening of the Plantar Fascia. For chronic heel pain conditions we classically use shockwave therapy but as Gordon was taking low dose aspirin we could not use this treatment at this time. He agreed to abstain from use and we would use the treatment in due course. Our first treatment session involved mobilisation of the ankle joint and the joints that comprise the arch of the foot as these joint were found to be very tight and restricted in motion. This was achieved by the application of a series of low force mobilisation techniques. We coupled this with dry needling of the heel bone, arch of the foot and inside leg. Dry needling, better known as acupuncture, is the application and percussion of small, thin needles inserted into certain areas of the body to elicit a cellular response. It is our belief that this will lead to the modulation of pain and increased blood flow to the area. This ultimately will stimulate the body’s ability to heal the damaged site. To compliment this we finished off with a deep tissue massage of the sole of the foot and the muscles at the side of the arch and inside lower leg. Gordon’s initial feeling was that when standing and walking, the foot could now move and bend easier and felt less tight. We booked another session for 1 week later and instructed calf and arch stretching exercises to be completed daily. On return Gordon commented that walking had been easier and that the pain levels had reduced significantly. On assessing the various joints of the foot it was evident that the range of motion had increased, the tissues on the sole of the foot appeared less tight and pressing on the principle site of pain was less uncomfortable. For this reason, we continued with the treatment protocol of mobilisation of the joints, acupuncture and deep tissue massage. Again, immediately, he felt the foot freer and an ability of the foot to bend and rotate more naturally. On our third visit, Gordon commented that this was the best his foot had felt in 20 years and the pain was now at a much more tolerable level. At this stage custom foot orthotics (insoles) were included into the treatment strategy. The custom foot orthotics were designed to reduce the forces acting upon the heel bone and to reduce the arch from dropping. The dropping of the arch increases the tension on the soft tissue in your arch, namely the Plantar Fascia. As these soft tissues insert into your heel bone, increased tension will likely lead to trauma at the insertion point and subsequent pain. This process involved laser scanning the feet to capture an accurate 3D scan of the feet, designing the orthotics using computer software and the processing of a file which we sent to our dedicated fabrication facility, Epione Orthotics, in Aberdeen. The resultant orthotic devices were made of a soft, rubberized foam material. 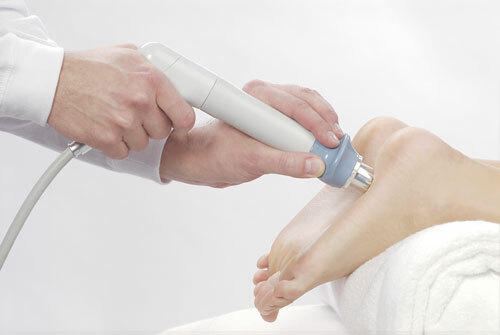 During this session we included shockwave therapy, our newest addition to The Shand Practice. Shockwave therapy has been well documented in the medical literature for the treatment of chronic heel pain and Achilles conditions. We believe that the treatment increases blood flow to the injured tissue and re-engages the body’s natural healing mechanism. Great results have been seen at the clinic for stubborn heel pain cases. Three sessions of shockwave therapy were booked, one week after another. The sessions lasted 10-15 minutes and produced only minimal discomfort. We were amazed at how quickly a chronic painful condition could be helped so significantly enabling our patient to get back to enjoying his game again and enjoying an active, happy retirement. After 20 years of heel pain, Gordon believed that nothing would help him. Podiatric intervention proved very helpful and he was happy with the improvements made.